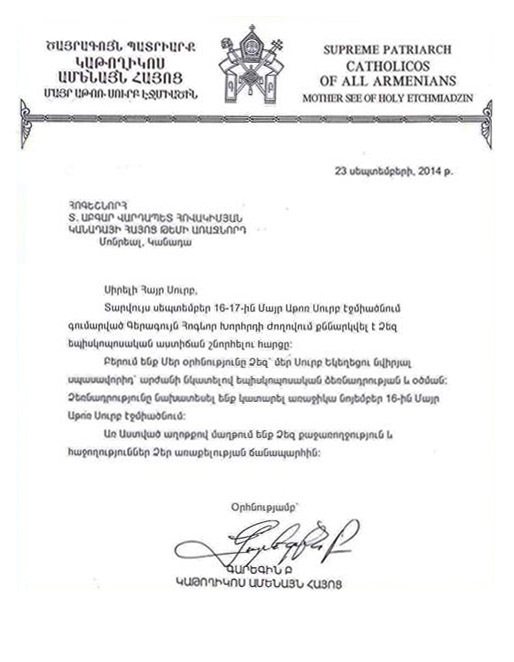 On behalf of the Diocesan Council of the Diocese of the Armenian Church of Canada we announce with deep gratification that on Sunday, 16th November 2014, with the distinguished edict of His Holiness Karekin II, Supreme Patriarch and Catholicos of All Armenians, the newly elected Primate of the Diocese, Very Rev. Fr. Abgar Hovagimian will merit the Episcopal ordination and anointment by His Holiness the Catholicos. The Diocesan Council expresses his filial love and gratitude to His Holiness Karekin II, Catholicos of All Armenians for this high recompense and inviting all Canadian Armenian faithful to remember the Eminent Primate in their prayers, wishing Him to continue to serve for the glory of God and edification of the Armenian Apostolic Holy Church. On this solemn occasion, the Diocesan Council expresses gratitude to the faithful for their support and help extended to the Diocese.